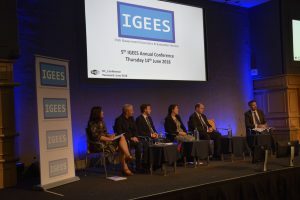 The 5th IGEES Annual Conference was held last Thursday 14th June, in the Hibernia Conference Centre in Dublin Castle. This conference gives us the opportunity to showcase the work that is carried out by IGEES staff across the whole of the civil service. It also brings together people from not only the civil service but the wider academic and international community. This year’s keynote speaker was Mr Pete Fontaine, formerly of the US Congressional Budget Office, who gave a very insightful talk on what the work of the US CBO is and how it interacts with the US political system.